Brand new registrable enduro model to arrive locally this spring. 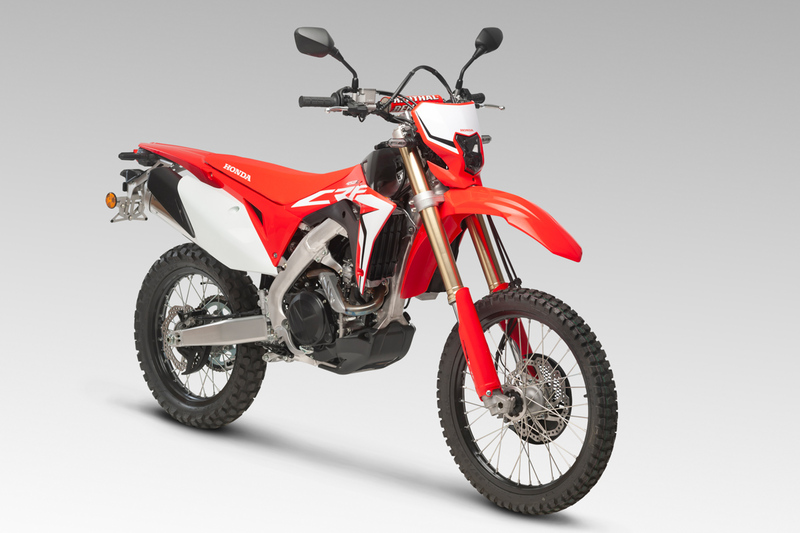 Honda Motorcycles Australia has announced the exciting release of the road-legal 2019 Honda CRF450L enduro model overnight, marking an all-new addition to its fleet of dual-sport motorcycles. Using the CRF450R base, Honda’s new dual-purpose motorcycle has a tough, lightweight chassis built to find all the available grip, powered by an engine that delivers strong, usable power right from the bottom. Durable, high quality parts and long service intervals aim for a worry-free riding and ownership experience. It is unmistakably a race-bred CRF – and looks it – but with the additions and modifications needed to be the road-legal dual-purpose enduro we’ve been waiting for. As such, the CRF450L is a complete package, as happy roosting trails as it is linking them up on-road. 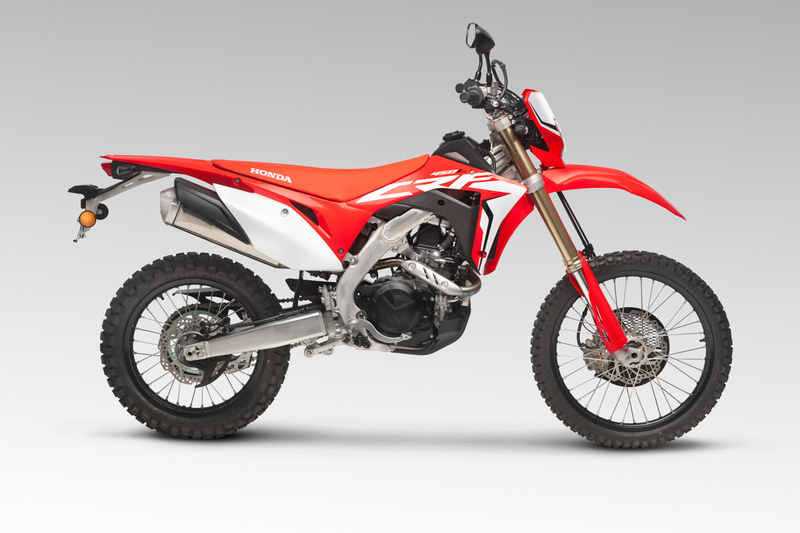 It’s still a CRF450R – just one that’s quieter, from the engine to the new exhaust. Both fuelling and ignition maps are now managed by an 02 lambda sensor; compression ratio has been lowered and crank mass increased for improved drivability. The gearbox is a six-speed – for longer legs on the road – and a cush drive has been added to the 18-inch enduro-spec rear wheel. The plastics are lifted directly from the CRF450R and all lighting is LED, with the front headlight in particular throwing out a penetrating beam. Increased volume for the titanium fuel tank adds range and all the items that make the CRF450L ready to purchase as a licensed, road going machine – such as speedometer, horn, indicators and mirrors – are standard. When it’s a Honda, build quality and superior engineering are always a given, but this is where the CRF450L really stands out – it is designed to go 32,000km between major strip downs! 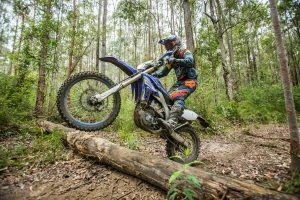 From the trail-rider’s perspective, that’s all you want and need – something that is beyond reliable and expected of a new Honda enduro machine. 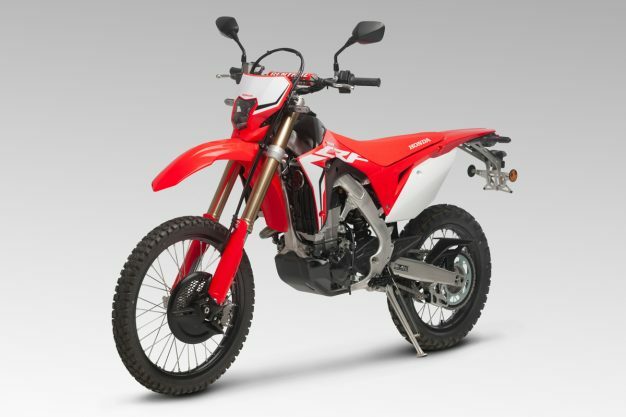 The CRF450L raises the bar in all areas. While the fundamental architecture of the four-valve Unicam powerplant remains the same, many details have been changed to support the broader role: the crank’s mass has been increased, resulting in 13 percent more inertia which, for a trail rider, equals improved torque feel and response – valve timing has been revised to give the broader, smoother spread of power and torque – the gearbox is now six-speed, rather than five for longer range use on tarmac – left and right engine covers wear outer covers to reduce noise. Elsewhere, the ACG has been uprated, to provide the required electrical power for the LED lights and to maintain battery charge during lower-speed running. 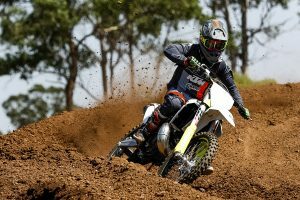 The battery itself is a high-volume unit (Lithium Ion) Bore and stroke are unchanged from the CRf450R, at 96mm x 62.1mm, but the piston uses 3 rings instead of 1 for greater durability. Compression ratio is 12.0:1 (compared 13.5:1). 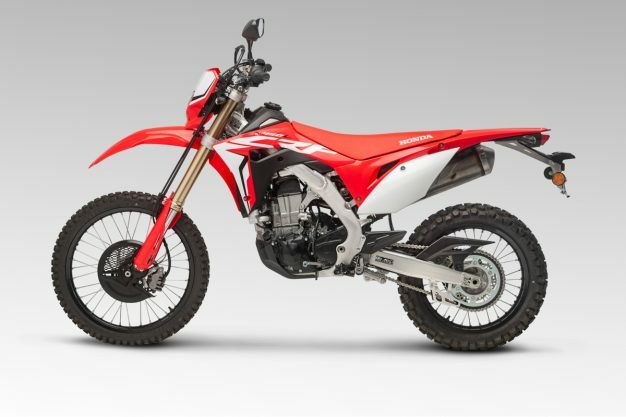 The redesigned airbox feeds the PGM-FI, managed by a lambda sensor in the large-volume single exhaust (which replaces the ‘stubby’ dual-pipe design of the CRF450R). An Air Injection (AI) system and catalyser clean up the spent gases. The four-valve Unicam cylinder head features a finger rocker arm on the inlet valves; valve lift is 10mm with 8.8mm exhaust valve lift. Inlet valve diameter is 38mm. The valve springs are oval in cross section and valve angle is 9° intake/10.5° exhaust. The clutch spins seven friction discs with a 2mm clutch plate efficiently dissipating heat; the springs generate a good, consistent connection. Having received a ground-up redesign in 2016, the CRF450Rs chassis was a perfect place for the CRF450L to start from, with changes to match the machine’s vastly broader usage range and road legal mission. Firstly, the tapered dual-spar aluminium beam frame was made slightly wider at the swingarm pivot points, to allow for the greater engine width resulting from the six-speed gearbox. The headstock was modified to mount a steering lock and the aluminium swingarm injected with urethane to reduce noise. The rear subframe is the same, with mounting point adjusted to take the taillight and the right-exit single exhaust muffler. Rake and trail are set at 28.2°/123mm with wheelbase increased 3mm from the CRF450R to 1495mm, for greater stability. Both the R and the L feature 22mm fork offset and the same 466mm swingarm pivot point height. Kerb weight is 131.5kg. A 49mm Showa steel-sprung USD fork – adjustable for preload plus compression damping – is matched by a fully adjustable Showa rear shock, operated through Pro-Link. A 260mm wave-pattern disc delivers effective heat dissipation, power and feel from the two-piston brake calliper working it – a matching 240mm wave-pattern disc and single-piston calliper is at the rear. 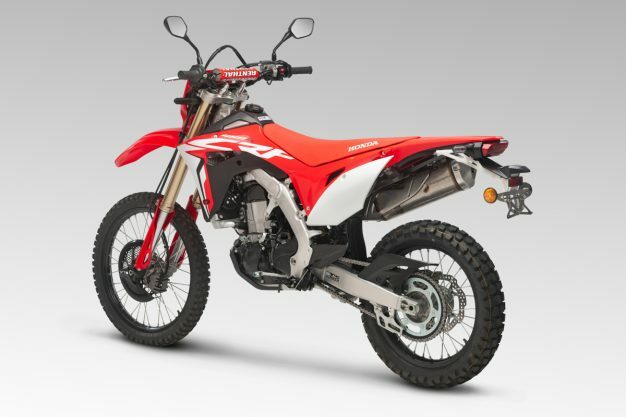 Whereas the CRF450R machine uses a 19-inch rear wheel, the CRF450L has an 18-inch (to fit enduro-spec tyres), with the addition of a cush drive to absorb chain shock; a sealed 530 chain is protected by a plastic chain guard. The front wheel is a 21-inch and both rims are finished in black. Tyres are sized 80/100-21 front and 120/80-18 rear. The CRF450L carries the true CRF heritage, but with styling derived from Honda’s new-gen CRF-R model directive, including the durable film-insert graphics and stream lined bodywork. Also carried over are the rear mudguard, side panels and bash plate. Svelte side shrouds hide a larger radiator volume plus electric fan. All lighting (including the indicators and license plate light) is LED, a speedometer, horn, brake-light switch and mirrors satisfy legal requirements while a side stand adds convenience. The titanium fuel tank is 7.6L and the fuel cap locks in place. Pricing and availability is yet to be revealed, however it’s anticipated the model will be in dealerships as soon as spring this year. 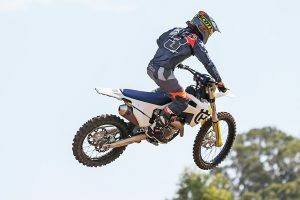 For more information, visit motorcycles.honda.com.au.